We get another trip into the Speed Force this week and it’s a lot different from the bright, loving (if emotionally difficult) Speed Force we saw in “The Runaway Dinosaur” last season. “Into the Speed Force” explores what the all-powerful, all-knowing entity of the Speed Force thinks about Barry’s Flashpoint-causing actions and, spoiler alert: it isn’t happy. But what does the Speed Force’s unhappiness with Barry mean for Barry, and what is his takeaway from the experience? Not a whole lot, when you get down to it. “Into the Speed Force” talked a big game on the “important lessons” front for Barry but had very little actual implementation. 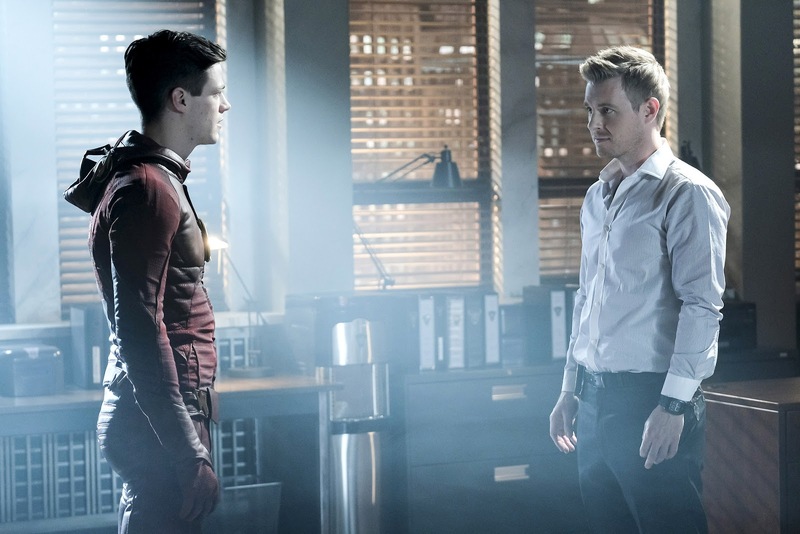 This episode was a darker, weaker echo of “The Runaway Dinosaur” — with the added sadness of an official Barry/Iris break-up and more of the same old Barry making the same old mistakes. By the end of his first encounter with the Speed Force, I felt like Barry actually grew as a character. By the end of this encounter, I kind of just wonder what the writers want me to do with the information they’ve given me. Is Barry forgiven? Did he learn anything? Am I supposed to be okay with Flashpoint now? Don’t know! Our hero jumps out of the earthbound plot immediately, as Barry decides to follow Wally into the Speed Force in order to get him back and make Joe less sad. I can get behind that motivation. Sad Joe is bad, yo. Although Cisco is roped into helping Barry through a breach and the team is ostensibly monitoring his life signs in S.T.A.R. Labs, most of the focus is on trying to find a way to stop Savitar now that he’s free and isn’t just a disembodied voice using poor Julian as a puppet. No one is more determined (and more reckless) than Jesse, who is desperate to find a way to save Wally and has apparently adopted all the idiocy of her fellow speedsters, because she actually goes after Savitar alone. And how does Jesse find Savitar? With the bit of claw that got hacked off of him last episode, which acts as a sort of homing beacon for the glowy God of Speed. Oh, and also — that god thing? Probably not true. Jesse escapes from Savitar’s clutches by stabbing him with his dismembered talon, and H.R. later theorizes that Savitar’s appearance probably isn’t some manifestation of evil brought on by too much time in the Speed Force. It’s probably just a very high tech and possibly metahumun-esque suit. This is good news in terms of heroics and beating the Big Bad of the season, but it’s pretty much the only good news we get this episode. Barry returns from his Speed Force adventure all sad, since he had to leave Jay Garrick of Earth-3 behind in Wally (and Barry’s) place. I don’t really understand why the Speed Force requires the constant mental and emotional torture of a speedster, but those are the rules established in this episode. Also when Barry returns: he formally breaks up with Iris, even though they both love each other and both want to get married and I don’t get why television shows pull this romantic drama crap constantly. Ugh. The A-plot of the episode is the stuff that happens to Barry, even though it’s all metaphysical and psychological blah blah blah. Unlike the Speed Force that taught Barry to let go of the emotional trauma tied to his mother’s death and learn to be a hero, this Speed Force has turned out all the lights and brought some ghosts to haunt Barry with what might have been. The weird thing, though? Speed Force brings back Eddie and Ronnie, whose deaths I don’t think anyone can blame Barry for. I guess the floating spectre of John Diggle’s baby-daughter-that-never-was just didn’t have the same gravitas. Barry finds Wally pretty quickly and learns that Wally’s being tortured by re-living the death of his mother over and over again. I reiterate: I do not understand this Speed Force. Is this something that it set up just to guilt the crap out of Barry? Is the Speed Force just capricious and bored? I don’t know. This whole Speed Force thing feels half-baked throughout the episode, but I’ll talk about that at length later in the review. After battling Time Wraiths and guilt trips from people he used to know and the hammy hamminess of Leonard Snart, Barry starts talking like he might stay in the Speed Force for Wally. And yet, the Speed Force still doesn’t really like what Barry’s saying and keeps throwing more stuff at him. Eventually, he gets rescued by Jay Garrick, who had been called in by Cisco because Cisco knows that Barry can’t do a damn thing on his own. Last thing Barry did on his own? Broke the universe. Dude’s a mess. Jay Garrick realizes that he’s the only speedster hanging out in the Speed Force whose name doesn’t regularly appear in the opening credits of the show this season, so he’s the one who has to stay behind while Barry figures out a way to send Savitar back in to take his place. Wally and Barry go home, and the Speed Force adventure is over. They are left full of angst, but alive. I am left confused, but also alive. 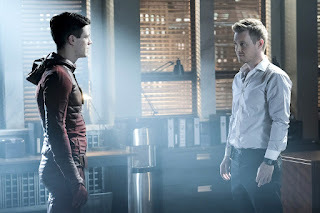 Does anyone else get the feeling that the writers sort of wrote themselves into a corner with the Flashpoint plot? I completely understand why they did Flashpoint: it’s an iconic comic book story and lends itself to a lot of interesting ideas, so they were excited to get their hands on it and mess around in the universe it created. However, I don’t think they expected the (completely understandable) fan backlash against their main character and hero, the ever-idiotic Barry Allen. Because Barry epically screwed up when he created Flashpoint. His actions had serious consequences that affected the lives of the people around him and could possibly lead to the death of Iris West, and it’s messed up and he definitely needs to atone for it. So now there’s this dilemma for The Flash writers, where they’re trying to balance the proper punishment for Barry Allen with the fact that he’s, you know, the main character of the show. He can’t actually be punished. Not because he’s moral Teflon or because he doesn’t deserve punishment, but because anything the writers do to him has to hurt other characters, not Barry himself, and that just adds more fodder to the Barry Blame Game. Wally gets sent to Speed Force Hell. Jay gets sent to Speed Force Hell. Jesse has to leave Earth-1 in order to take over as The Flash for the missing Jay on Earth-3. Iris gets her heart broken. Iris dies. All of it — every single thing that Barry feels guilty about, everything that hurts him emotionally and does genuinely punish him — has to go through other characters in order to get to him, and that’s not fair. This episode actually touches on this dilemma through the angry Speed Force, which keeps trying to get Barry to understand that he is the one who should suffer. Barry is the one who should stay behind in the Speed Force while Wally saves Iris, because it’s Barry’s fault in the first place that Iris is in danger. More than that, Barry agrees! He completely agrees that Wally doesn’t deserve to be punished, that Jay doesn’t deserve to be punished, and that Iris definitely doesn’t deserve to die — but it doesn’t matter that Barry agrees because the framework of a TV show like The Flash means that we see Grant Gustin on our screens every week as the titular Flash and that isn’t changing, no matter how much it would make sense in-universe for Barry to go to speedster jail and let others take his place for a while. Thus, the problem that the Speed Force highlights for us in the episode: "You keep telling us one thing and doing another." The Flash keeps telling us that Barry — and no one else — should be penalized for the mistake Barry made, but it never penalizes just Barry. It never can do that, because what would they do? Have Barry run around in Speed Force Hell for a few episodes while Wally takes up the Flash mantle? ... Uh, yeah, I don’t really see a problem with that? Listen: I adore Barry and I don’t believe for a second that Grant Gustin would simply not appear for a few episodes, but I genuinely think The Flash could make a good storyline in which Barry goes on an extended “The Runaway Dinosaur”-esque pain adventure while Wally matures and learns to be a hero as The Flash instead of Kid Flash for a couple weeks. I think it would’ve been an interesting way to develop Wally’s character and Barry’s character while also giving the fans the Barry-flogging that they’ve been crying out for ever since Barry accidentally erased John Diggle’s daughter. Musical episode next! That’s all. Oh, wait, secondary bullet point: Earth-2 still has no speedster because Jesse skips off to Earth-3 instead. What’s going on there? Is it just chaos? Or are all the villains taking a vacation too?